Iatrogenic Major Vessel Perforation During Lumbar Surgery. A Threat Negated Successfully! Volume 12 | Issue 1 | Jan-Mar 2017 | Page 32-36 |Ketan S Khurjekar, Shailesh Hadgaonkar, Ajay Kothari, Himanshu G Kulkarni, Shardul Date, Suryabhan Bhalerao. Vascular injury, though rare, is a grave complication that one can have after lumbar surgery. Despite rapid developments in diagnostic and surgical techniques, no significant decrease in the incidence seems to have occurred over the past 50 years. The incidence of prevertebral vascular injuries is around 0.01–0.05%, but the reported overall mortality is as high as 15–65%. Prompt diagnosis and early intervention are of utmost necessity in these cases or else outcome could be catastrophic. Endovascular repairs is the recent trend that offers a safe, minimally invasive solution with low morbidity, but unavailability of that facility shouldn’t be a hindrance in prompt response to the life threatening injury in form of open repair of the lacerated vessel. We present a case of iatrogenic injury to Right external iliac artery in during of L4-5 discectomy and instrumented fusion for spondylodiscitis post microdiscectomy, which was managed successfully with a cover stent on lacerated artery. Key words: Vascular injury, lumbar spine surgery, complication. Lumbar discectomy through posterior approach is one of the most commonly performed procedures in Orthopaedics. The procedure is considered one of the safest, but it’s associated with its share of complications. Infective spondyodiscistis after lumbar surgery is a painstaking complication that one comes across after lumbar surgery. It can lead to major morbidity after the surgery in form of the work days lost, and can usually necessitate operative intervention for successful treatment. Vascular injury, though rare, is a grave complication that one can have after lumbar surgery. The incidence of prevertebral vascular injuries is around 0.01–0.05% [1-4], but the reported overall mortality is as high as 15–65% [5,6]. The Mortality in these cases is directly related to the diameter of the injured vessel, size of the tear and most importantly, rapidity of diagnosis and early intervention  Due to their anatomy, common iliac vessels and their branches lie in close proximity with lower lumbar vertebrae, and are vulnerable to injury if accidental perforation of the anterior annulus fibrosus and anterior longitudinal ligaments occurs during discectomy  Damage to these vessels presents an immediate threat to life from haemorrhagic shock, which frequently leads to death or serious long term complications such as arteriovenous fistula or pseudoaneurysm. Also, due to self-sealing effect that both anterior annulus fibrosus and the anterior longitudinal ligaments have due to their tough and elastic nature, and tamponade created by the prone position of the patient during surgery, the signs of blood loss may be delayed till patient is shifted to recovery, which could prove fatal [8-10]. High index of Suspicion, Prompt diagnosis, and early intervention are extremely necessary in these injuries. Regarding the intervention, the Pendulum has shifted in recent years towards endovascular procedures than direct repairs via an open laparotomy . Extensive laparotomy procedures in patient just coming out of general anaesthesia and having hypotension can have high mortality. We present a case of iatrogenic injury to Right external iliac artery in during of L4-5 discectomy and instrumented fusion for spondylodiscitis post microdiscectomy, which was managed successfully with a cover stent on lacerated artery. A 50 year old lady presented in the OPD with low back pain with right lower limb radiculopathy. Patient was a known diabetic, on insulin since last 10 years, but was having good glycaemic control. Right SLR test for the patient was 50 degrees, with no neurodeficit seen on clinical examination. MRI Of lumbar spine showed Right paracentral and foraminal disc protrusion at L4-5 level. After pre-anasthetic evaluation, Patient underwent Right sided microscopic discectomy. Surgery was uneventful, roots were made completely free without disturbing the midline. Patient was discharged on 3rd day as a standard protocol. 2 weeks after the procedure, patient developed excrutiating back pain. She also had pain while twisting and turning in the bed with bilateral lower limb radiculopathy. Patient also gave history of occasional spikes of fever. On haemogram, ESR was 78 mm/h (normal range: 1–20 mm/h), and the C-reactive protein (CRP) level was 36 mg/dL (normal range: 0–0.3 mg/dL). White blood cell (WBC) count was 14,400/mcL (normal range: 3,700–9,700/mcL). MRI Showed post-operative spondylodiscitis at L4-5 level. Empirical IV antibiotics were given for 4 weeks after the diagnosis, but the patient had no relief from the symptoms. Decision was taken to do open debridement and instrumented fusion of L4-5. Posterior incision was taken, dissection was done in midline. Instrumentation was done, posterior decompression was done. While doing discectomy, disc forceps was inserted from right side. After taking a bite, sudden gush of blood was seen, so roller gauze was packed from that side and discectomy was continued from left side. Roller gauze was removed after 20 mins, no more bleeding was seen. Anaesthetist confirmed that the patient was stable haemodynamically, so debridement and discectomy was completed, endplates were curetted and cancellous graft was packed in the disc space. Closure was done, patient was found to have normal blood pressure and heart rate, so was shifted to recovery ICU. Still to be on the safer side, bedside USG was done, which showed a slightly bulky right psoas which was a new finding compared to pre-operative MRI. But since patient was haemodynamically stable, no active intervention was planned by the vascular surgeon. 2 hours after the patient was shifted to recovery, blood pressure dropped suddenly to 60/30 mm of Hg with heart rate reaching 100 beats/min. Bedside USG showed large intraabdominal collection. Vascular injury was suspected, arterial line was secured and patient was immediately shifted for angiography, which showed Leak in the external iliac artery just below the right common iliac bifurcation. Patient was shifted to operation theatre with administration of inotropes and cover stent was applied over the leak by the vascular surgeon under the fluoroscopy. No leak was seen on repeat angiography. BP was stabilized and patient improved hemodynamically after the procedure and within 3 hours after first episode of hypotension. 3 units whole blood, 4 units of packed cells and 4 units of fresh frozen plasmas were administered during this period of 3 hours. Patient was kept in intensive care unit for 2 days and then was shifted to room. Patient was discharged on 8th post-operative day. On 6th month follow up, patient was symptom free, without any vascular of neurological complications. Improvements in surgical techniques and instrumentation have allowed for enhanced and better outcomes in lumbar spine surgery. Though very routine and usually safe, lumbar disc surgery can have array of complications. For post-operative infections, rates in the literature vary widely (0.3% to 9%) depending on preoperative diagnosis, the type of procedure and patient population [12-15]. The infections can have problematic sequelae including failure of fixation, vertebral osteomyelitis, pseudarthrosis and spondylodiscitis. Incidence of Post-operative discitis after lumbar discectomy varies from 0% to 3% in literature [16,17. To avoid serious and irreversible neurological complications, early detection and appropriate management of infections is necessary. Pyogenic spondylodiscitis remains a challenge even though diagnostic and therapeutic possibilities have drastically improved recently due to medical advances. It is stated in many studies that number of patients who are unable to resume their old work after surgery due to spondylodiscitis range between a whopping 66.7% to 87.5 % [18,19]. Due to possibility of this huge morbidity, accurate treatment of post-operative spondylodiscitis becomes paramount. Whether to treat the spondylodiscitis conservatively or operatively has been an eternal debate. Many authors have recommended that conservative treatment has good outcome in cases if selected properly. Many studies have shown that 6 weeks of antibiotic treatment appear to have a similar mortality, relapse, and failure rate as 12-week treatment [20,21]. Tissue biopsy for culture and sensitivity from disc lesion can be can be extremely specific, but empirical antibiotic therapy based on blood culture with consideration for gram negative organisms and monitoring of inflammatory parameters till then is usually effective . The indications of surgical treatment have been clearly described in literature, being the failure of conservative treatment, compression of neurological structures, Spinal instability and deformity. Many of the recent studies have shown that single staged posterior approach for debridement and fusion with PEEK cage gives excellent results [23,24]. Even the use of metallic titanium implants in pre-existing infection has been rendered safe by these studies. In our case, we used a similar approach, and used only cancellous bone graft in place of PEEK cage. Extra cautious approach from surgeon is advised when one of the above factors is already in the place to avoid Intraoperative vessel injuries. Intraoperative vessel injuries can be divided into two types [28,29]. Most common incidence for vascular injury is during L4-L5 or L5-S1 disc surgeries. During disc removal, the disc forceps may slip through the anterior longitudinal ligament and enter the retroperitoneal space of the abdominal cavity, where vascular injury may occur after a deep bite due to proximity of vessels to lower lumbar vertebrae . It’s a known fact that aortic bifurcation and IVC confluence occur at or below L4 and are separated from L4-5 disc space only by the anterior longitudinal ligament. Also, due to self-sealing effect that both anterior annulus fibrosis and the anterior longitudinal ligaments have due to their tough and elastic nature, bleeding from lacerated vessel tends to be limited to the retroperitoneal space rather flowing vigorously to the operating site, which explains why bleeding in the surgical site is observed in less than 50% of the reported cases [31,32]. We experienced a similar scenario in our case. When a laceration of artery occurs, it causes rapid exsanguination. Signs of arterial injury include transient (usually sustained) and refractory hypotension due to hypovolemia, wide pulse pressure, tachycardia, decreased haematocrit, and feeble or impalpable pulsation in a lower extremity. These signs warrant for a rapid response. Venous injury if small, may go undiagnosed contributing to underestimation of the prevalence of this complication [33,34]. In addition, it also can cause postoperative deep venous thrombosis 35. Arteriovenous fistula may be formed immediately, if the laceration includes both arterial and venous tear. Arterial haemorrhage evacuates via the venous defect leading to little or absent bleeding or retroperitoneal haematoma, and has absent hypotension since no blood leaves vascular compartment [36,37]. The fistula may remain silent for a long time. They may present with high output cardiac failure and/or lower leg oedema. Pseudoaneurysms originate from a localised arterial wall disruption, which won’t bleed immediately. These partial contusion of a major vessel wall may lead to delayed haemorrhagic shock on doing strenuous work due to spontaneous rupture and/or thrombosis . It has also been considered that delayed hemodynamic signs may be related to a compressive effect of the prone position, which gets nullified when patient is made supine while shifting. However, a recent study showed with lumbar computed tomographic scans that the prevertebral vascular anatomy appears similar in the supine position and in a prone position usually used for posterior lumbar surgeries . Magnification used as a routine practice today could also prove to be a pitfall. A study has shown with serial CT scans that sagittal diameter of the three lowest lumbar discs is between 33 and 56 mm. Use of magnification loops and microscope may lore the surgeon in overestimating the size of the disc space, which may result in inadvertent advancement of disc forceps during disc removal . Angiography is considered the gold standard for diagnosing iatrogenic acute vascular injury during lumbar disc surgery. Angiography assesses in real time and localizes the bleeding site. It also shows whether the bleeding is still active, and allows immediate repair of the laceration.40 Duplex ultrasound and CT scans have also been found useful in detecting the extent of bleed and differentiating between arterial and venous bleed but these seem more suitable in elective settings for cases with delayed onset symptoms [8, 41]. Literature has always emphasised on early diagnosis and prompt surgical intervention for repair of major vessel injury. But, Mortality associated with these open surgeries has been high especially in these emergency setting in haemodynamically unstable patients. Elective repairs of AV fistulas and Pseudoaneurysms have been tolerated well but not emergency repairs of laceration via open laparotomies. To avoid this morbidity and mortality associated with open procedures, pendulum has shifted to endovascular repairs like cover stents and coilings in recent years. First such procedure was reported in 1995, when Zajko et al reported the first endovascular repair of a right common iliac artery to inferior vena cava fistula . Endovascular repairs have now become a preferable method because of the minimally invasive technique that prevents the need for open surgical repair and its lower risk compared with open surgical repair. Also, long term follow ups of these cases have shown excellent results, which proves that these endovascular techniques with stent-graft placement are here to stay . Only drawback of the endovascular repairs are that it needs extensive requisites and expertise which may not be available in all medical centres, limiting these facilities to only perform traditional open surgical repair. So to conclude, though rare, vascular injuries in lumbar surgery are a fact. Surgeons should keep this complication in mind and along with anaesthetists should have high index of suspicion about the same since early and prompt diagnosis is a necessity. Endovascular repairs offer a safe, minimally invasive solution with low morbidity, but unavailability of that facility shouldn’t be a hindrance in prompt response to the life threatening injury in form of open repair of the lacerated vessel. 1. Szolar DH, Preidler KW, Steiner H, Riepl T, Flaschka G, Stiskal M, et al. Vascular complications in lumbar disc surgery: report of four cases. Neuroradiology 1996;38:521–5. 2. Gurdijian ES, Webster JE, Ostrowski AZ, Hardy WG, Lindner DW, Thomas LM. Herniated lumbar intervertebral discs: an analysis of 1176 operated cases. J Trauma 1961;1:158–76. 3. Papadoulas S, Konstantinou D, Kourea HP, Kritikos N, Haftouras N, Tsolakis JA. Vascular injury complicating lumbar disc surgery. A systematic review. Eur J Vasc Endovasc Surg 2002;24:189–95. 4. Goodkin R, Laska LL. Vascular and visceral injuries associated with lumbar disc surgery: medicolegal implications. Surg Neurol 1998;49:358–72. 5. Ewah B, Calder I. Intraoperative death during lumbar discectomy. Br J Anaesth 1991;66:721–3. 6. Franzini M, Altana P, Annesi V, Lodini V. Iatrogenic vascular injuries following lumbar disc surgery. Case report and review of the literature. J Cardiovasc Surg (Torino) 1987;28:727–30. 7. Murat Dosoglu et al, Nightmare of lumbar disc surgery: iliac artery injury, Clinical Neurology and Neurosurgery 108 (2006) 174–177. 8. Papadoulas S, Konstantinou D, Kourea HP, Kritikos N, Haftouras N, Tsolakis JA. Vascular injury complicating lumbar disc surgery. A systematic review. Eur J Vasc Endovasc Surg 2002;24:189−95. 9. Ewah B, Calder I. Intraoperative death during lumbar discectomy. Br J Anaesth 1991;66:721−3. 10. Hanouz JL, Bessodes A, Samba D, Gerard JL, Bricard H. Delayed diagnosis of vascular injuries during lumbar discectomy. J Clin Anesth 2000;12:64−6. 12. Glassman SD, Dimar JR, Puno RM, et al. Salvage of instrumented lumbar fusions complicated by surgical wound infection. Spine 1996;21:2163–9. 13. Roy-Camille R, Saillant G, Mazel C. Internal fixation of the lumbar spine with pedicle screw plating. Clin Orthop Relat Res 1986;203:7–17. 14. Abbey DM, Turner DM, Warson JS, et al. Treatment of postoperative wound infections following spinal fusion with instrumentation. J Spinal Disord 1995;8:278–83. 15. Massie JB, Heller JG, Abitbol J-J, et al. Postoperative posterior spinal wound infections. Clin Orthop Relat Res 1992;284:99–108. 18. Pilgaard S.,Discitis. 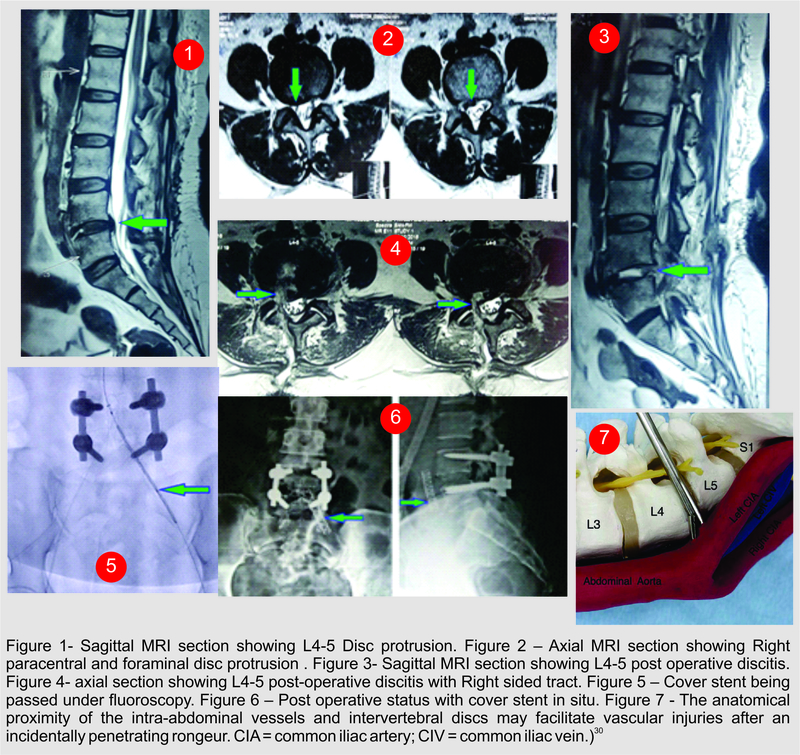 Closed-space infection after lumbar discus prolaps operation, Acta Orthop Scand. 1969;40(5):681. 25. Linton RR, White PD. Arteriovenous fistula between the right common iliac artery and the inferior vena cava: reportof a case of its occurrence following an operation for a ruptured intervertebral disc with cure by operation. Arch Surg 1945;50:6e13. 26. Inamasu J, Guiot BH. Vascular injury and complication in neurosurgical spine surgery. Acta Neurochir (Wien) 2006;148:375e87. 27. Szolar DH, Preidler KW, Steiner H, Riepl T, Flaschka G, Stiskal M,et al. Vascular complications in lumbar disk surgery: report of four cases. Neuroradiology 1996;38:521e5. 28. Gurdijian ES, Webster JE, Ostrowski AZ, Hardy WG, Lindner DW, Thomas LM. Herniated lumbar intervertebral discs: an analysis of 1176 operated cases. J Trauma 1961;1:158–76. 29. Tsai YD, Yu PC, Lee TC, Chen HS, Wang SH, Kuo YL. Superior rectal artery injury following lumbar disc surgery. J Neurosurg (Spine 1) 2001;95:108–10. 31. Harbison SP. Major vascular complications of intervertebral disc surgery. Ann Surg 1954;140:342−8. 32. Desaussure RL. Vascular injury coincident to disc surgery. J Neurosurg 1959;16:222−8. 33. Nadstawek J, Wassmann HD, Boker DK, Schultheiss R, Hornchen U. Injuries to the large abdominal vessels during lumbar nucleotomy. J Neurosurg Sci 1989; 33: 281±286. 34. Dula JD, Fierro R, Gessner H, Snover SW. Vascular injury following disc surgery. Am J Emerg Med 1986; 4: 406±408. 35. Quigley TM, Stoney RG. Arteriovenous fistulas following lumbar laminectomy: the anatomy defined. J Vasc Surg 1985; 2: 828±833. 36. May ARL, Brewster DC, Darling RC, Browse NL. Arteriovenous fistula following lumbar disc surgery. Br J Surg 1981; 68: 41±43. 37. Duque AC, Merlo I, Janeiro MJ, Madeira EN, Pinto- Ribeiro R. Postlaminectomy arteriovenous fistula: the Brazilian experience. J Cardiovasc Surg (Torino) 1991; 32: 783±786. 38. Smith RF, Killen DA. Arteriovenous fistula and chronic congestive heart failure following intervertebral disc surgery. South Med J 1973; 66: 1301±1303. 39. Anda S, Aakhus S, Skaanes KO, Sande E, Schrader H: Anterior perforations in lumbar discectomies. A report of four cases of vascular complications and a CT study of the prevertebral lumbar anatomy. Spine 1991;16:60. 40. Nam TK, Park SW, Shim HJ, Hwang SN. Endovascular treatment for common iliac artery injury complicating lumbar disc surgery: limited usefulness of temporary balloon occlusion. J Korean Neurosurg Soc 2009;46:261e4. 41. Skippage P, Raja J, McFarland R, Belli AM. Endovascular repair of iliac artery injury complicating lumbar disc surgery. Eur Spine J 2008;17(Suppl 2):S228e31. 42. Zajko AB, Little AF, Steed DL, Curtiss EI. Endovascular stentgraft repair of common iliac artery-to-inferior vena cava fistula. J Vasc Interv Radiol 1995;6:803e6. 43. L. Canaud et al, Endovascular Repair of Aorto-iliac Artery Injuries after Lumbar-spine Surgery, Eur J Vasc Endovasc Surg (2011) 42, 167e171. How to Cite this article: Khurjekar K, Hadgaonkar S, Kothari A, Kulkarni HG, Date S, Bhalerao S. Iatrogenic Major Vessel Perforation During Lumbar Surgery…A Threat Negated Successfully! . Journal of Trauma and Orthopaedic Surgery.Jan – March 2017;12(1):32-36.